Just when you'd thought "ugh, enough already with the blog" here's one more brief post. The final day/night of shooting was a marathon event that concluded at 6:00AM -- an all-nighter. I wasn't there to blog about the excruciating details. I can say that although nobody actually ran 26.2 miles, I bet everyone felt as though they had. In a previous post I started to write about where the term "in the limelight" comes from. I've finally had a chance to refer back to Bill Bryson's "At Home" where he writes "if you took a lump of lime or magnesia and burned it in a really hot flame, it would glow with an intense white light." A british engineer and inventor Sir Goldsworthy Gurney, using a flame (made with a blend of oxygen and alcohol), was able to heat a marble size lump of lime "so efficiently that its light could be seen sixty miles away." The device was used successfully in light houses, and in theaters. 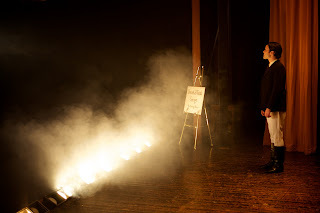 The light was not only "perfect and steady but also could be focused into a beam and cast onto selected performers -- which is where the phrase in the limelight comes from." The downside to the perfect but intensely hot light, was that it was a major fire hazard. "In one decade in America, more than four hundred theaters burned down." Bryson, At Home, p.126. And finally, in my day six post, I wrote about how the director etc. are "on" almost the entire time of a shoot. I forgot to mention Karlo, the omnipresent sound guy (boom operator). He's always in the knot of focused activity near the camera -- without him, it would be a silent movie. Thanks again for letting me share this experience. And now a few more pics: these are mine, not Jordan's so please pardon the quality. Arienne holding Josie, recording live baby sounds. Intern Madison, toiling away in wardrobe. Kimby, her Grandmother, and the extra (and Dallas Heritage Village employee/historian) playing the rail conductor. And I’m at the airport waiting to fly back to Denver. It’s mid-afternoon on a Tuesday, and I’m at Dallas’ Love Field. It’s mostly business travelers – and many travelers are working on laptop PC’s. On set I was surrounded by nothing but Apple products. There were multiple MacBook Pros in various shapes and sizes, most cast and crew had I-Phones, and last night during shooting, some important championship football game was streamed live on an I-Pad – to the delight of interested crew. It’s now back to the PC business world for me. They just announced that my flight’s departure is delayed by an hour – so time for one more blog entry. I left Carolyn’s house this afternoon when she, Kimby, and Funk were leaving for the 1:30 call. As she was getting ready to go, Carolyn discovered a data storage issue with yesterday’s footage. Carolyn is shooting the film using a digital format. I don’t know the specs, just that large memory cards are involved. 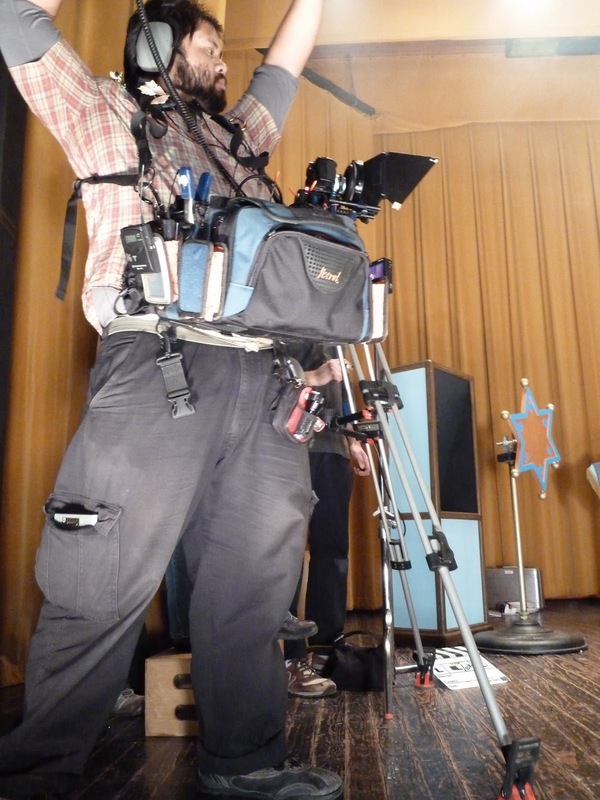 Throughout the shooting day, the assistant cameraperson (Anthony) manages the accumulating data. He transfers the data to portable drives and these drives in turn are then copied onto a dual hard drive later that night, or the following morning. Despite repeatedly explaining to me how to do this, the mechanics are still a bit of a mystery. My Apple file management skills are not up to snuff – I’ve spent too much time in the PC world. I do know that at the end of the final shoot there should be four digital copies of the footage. One of the most important aspects of the AC’s job is ensuring the daily shooting data is backed up in multiple locations. While Carolyn was showing me (again) how to back up the “the making of” 8 gig cards, she discovered the data storage issue. The backed up data from yesterday’s shoot (the important data, not my “the making of” data) had gone missing from its supposed location. As I left, Carolyn was making another copy for safety’s sake – a time consuming process. Because of this electronic snafu, she will be late for call time. If the data is lost, 14 plus hours of work by 30 or so people is gone. In all practicality, for this extreme low budget production, it cannot be recreated. The cast and crew will have another marathon day today finishing the shoot. Thank you Carolyn for letting me share the experience. Overall, I’m amazed at the sustained level of concentration it takes over the 12, 13, and 14 plus hour work-days. Everybody on set works very hard. Depending on the action, some positions may have more downtime than others. As talent commented yesterday, for some “it’s a lot of waiting.” This cast member had regretted forgetting reading material. Luckily I was able to provide my new copy of Vanity Fair to help pass the time. 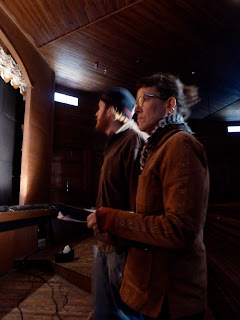 Overall, my outsider’s perspective is that the Director (Carolyn), DP (Kimby), Assitant DP (Anthony), Assistant Director (Barker), and Gaffer (Ben) work incredibly hard. They are “on” the entire time. They have no downtime whatsoever. The ultimate look of the movie is based on their collaborative decisions. They are the eye of a hurricane, surrounded by a whirlwind of activity. Of course, the talent is critical. Without the talent, there would be nothing to look at – no movie at all. But without the Director and DP’s decisions, shot planning, and execution, there would be nothing to go on. 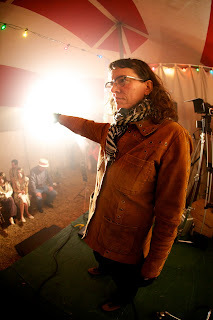 The action needs a director, and it needs to be properly filmed, and properly lit. 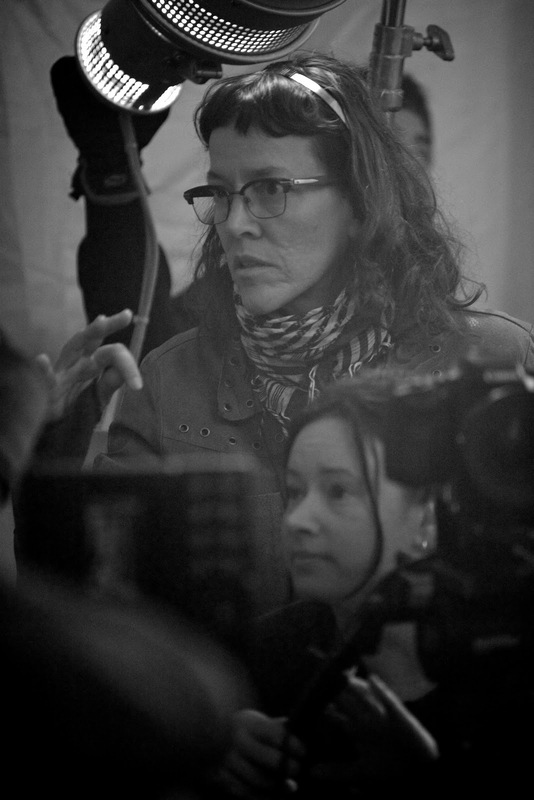 Also, the AD, must run a tight ship, try to keep the shoot on schedule, and insulate the Director and DP so they can concentrate on the task at hand – making a great movie. Here’s a dolly shot set-up in front of the extras for the circus scene. I rambled on about dolly shots very early this morning in yesterday's post. These last two pics are mine. This last pic is the one that ruined the scene -- at least it came out nicely. PS – I’m posting this from my home back in Denver, where it's barely 10 degrees. As I write this I know that there’s a bunch of very hard working folks toiling away in the cold, at Dallas Heritage Village, making Wanda the Wonderful. I’m still here. I was supposed to fly back to Denver today, but Carolyn, the continued bad Denver weather, and no charge to change my flight again, convinced me to hang around for another day. Thank you again to my wonderful husband for putting up with my delayed return, again. The morning started with Carolyn receiving a phone call from Patrick that Mr. Sam Funk had arrived from Wyoming, after spending a very short night in Denver. Patrick dropped him off at Carolyn’s house before heading over to the set. He brought lots of gear from Sam Hampton’s place in Wyoming. Colin and Maceyla in wardrobe will love the pieces of authentic Wyoming that Funk’s brought along. Thank you Sam and Janna for the real cowboy gear. The set is hopping today. The 1:00 call time is a bit of a relief. Arianne and Hannah (the makeup artist) worked until 3:00 am last night getting her hair ready for today’s scenes. 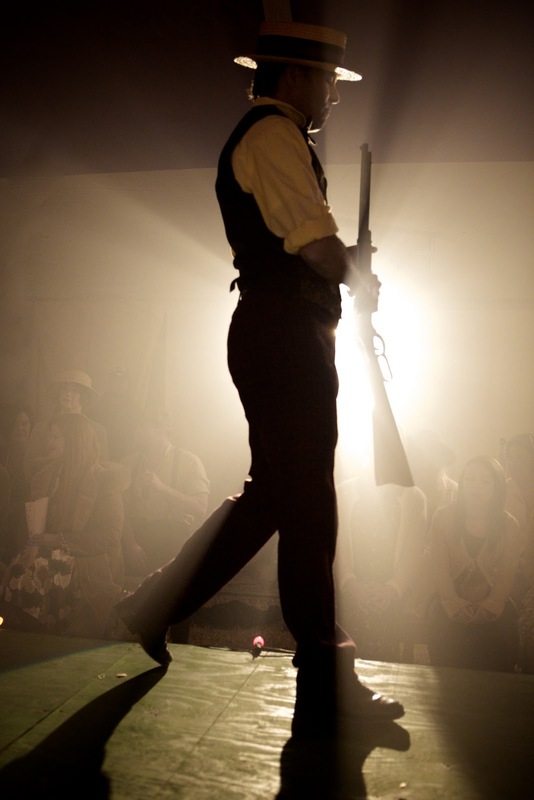 These last two days will all be shot in the Heritage Village Saloon. Chris the Art Director has transformed the room into the Ritz Hotel, Thermopolis Wyoming, circa June 18, 1929. Ben the gaffer is currently working on the lighting set up for the first scene. There are a number of cowboy extras sitting around with Liza. Liza is one of the dancing girl extras – she’s also a former student of Carolyn’s that’s helping with the editing – and she knows how to foxtrot. She’s helped out for the past year with the film. She’s been giving a few quick foxtrot lessons (along with another extra) to the other cowboys. They’ve found a deck of cards and some poker chips and are currently playing a real game of cards. Mr. James McMurtry is now on set, and he’s brought along a wonderful guitar from the 1940s – a Stewart. The first scenes we’re shooting are of Mr. McMurtry playing the guitar. It’s as close to period as he’s got. It sounds wonderful. We’re now doing close-ups (or inserts) of his hands as he plays. The saloon is full of crew and extras. There are anywhere between 18 to 24 people in the room at any given moment. We are all enjoying Mr. McMurtry’s fine playing in this intimate setting. I’m trying to resist applauding when the camera cuts. Mr. McMurtrey’s a pro – hitting his queue every time. I’ve successfully ruined one shot already. I was shooting video and handed my camera to the camera’s assistant to take a picture. The flash went off – a huge no no. Ugh. My apologies to the Director, Mr. McMurtrey, and the crew. It won’t happen again. We’re now changing the lighting for the next scene. The whole room configuration must be changed around – same scene, different angle. The lighting crew has jelled and is working efficiently. Yesterday I commented on the unique gaffer speak. One of the many gafferisms, is referring to a clothespin as a “C47.” Sources say that this originated from the defense contracting industry. Back in the 1940’s, the film industry made patriotic movies – and got paid by the federal government for doing so. In order to be abundantly compensated for each film, studios called clothespins “C47s.” Apparently, the Department of Defense would not pay for clothespins, but would pay for C47s. C47 sounds unquestionably technical and essential. C47 is thus a WWII defense contracting artifact. I’ve been reading Bill Bryson’s “At Home,” to unwind at night. He says the expression “in the limelight” comes from . . . . [I’m too tired to refer back to the book – so I’ll do it later]. It’s now almost midnight. The cast and crew are still diligently at work. I’m not sure how many more shots are left to get tonight – but everyone is moving quickly. The temperature’s dropped and the wind’s picked up. There are a couple of shivering production assistants that must remain outside to keep people from barging into the set. Bummer. Well I’d thought we were almost done – but instead we just completely changed the set for a dolly shot – the last of the evening. Getting a dolly shot means first clearing the set of all non-essentials, laying a track that must be hauled off of the lighting truck, properly configured, shimmed to level, then a smooth rolling dolly assembled and placed on top. 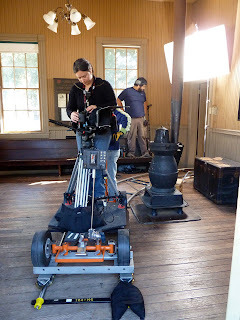 The camera and camera people all sit on the dolly with the grip pushing them back and forth on the track. The result on film is a wonderful sense of motion. We all pitched in to assist the gaffer and art department to quickly accomplish this and make the set correct. It’s now 1:10 am, the talent and extras are back in place, they’ve learned the foxtrot, and are now dancing to Mr. McMurtry’s guitar. Carolyn says we are now shooting MOS, when she’s free I’ll ask her what that means. Pizza’s were delivered and we’ve all had a slice or so in between shots. It’s now 2:00 – the dolly shot went well, and now talent is foxtrotting without music to get the dialogue. Our script supervisor went MIA several hours ago, and now we’re running out of pinch hitters to supervise script. The shooting continues, well directed but not supervised. The gaffers are packing up unessential items. We just finished the martini shot – the last shot of the evening. It’s a wrap – and a wrap for me, I’m heading out tomorrow. I’m typing this as quietly as possible. We’re shooting upstairs in another historic house at the Village. The cast, crew, and lots of lights are all stuffed inside a tiny upstairs bedroom in an old Victorian house. It’s cold and snowing outside – the weather system that’s been much discussed the past few days has finally arrived. Thankfully, this old Victorian house is heated. The upstairs bedroom is in fact over- heated with all the lights and bodies occupying the small space. The upstairs long Victorian hall is crowded with equipment. We’re essentially operating inside a museum so we have to take care not to damage all the historic items – including the house. The hallways are lined with drop cloths, and various items are wrapped in mover’s blankets. We are all dressed for the miserable weather outside – so the hallways and banisters are draped with various stripped-off outer layers. This set is on the opposite side of the Village from Wardrobe. I drove my rent-a-car here today because I was running a bit behind – what with rearranging my travel back to Denver. It’s snowing a lot in Denver and because of the travel alert Southwest Airlines encouraged preemptive rescheduling – without any fees. So, I’m flying out tomorrow instead of today. Thank you to my wonderful and understanding husband for covering for me for yet another day – I greatly appreciate it. Anyway, my rent-a-car is clutter-free and therefore I’m “talent transport” today. I drive to and from the makeup/wardrobe house picking up and dropping off the talent – and other essential crew that need to move fast and keep dry. I’m also now doing the video for “the making of” special feature. The guy who was doing this had a family medical emergency and had to drop out of the project. One of the extras from yesterday (and the days before) has volunteered and has been promoted to a production assistant. She’s now wearing a radio headset and standing outside shivering keeping people from making noise while the cameras are rolling. The lighting truck’s engine balked at starting in the cold weather. The truck has to be moved as close as possible to each set location because of the huge amount of lighting gear necessary for each shot – but not today. Today the gaffers had to transport equipment on dollies across the village. After they’d finished getting most of the gear here by foot – the truck’s engine started. It’s now parked out front. At least breaking down and will be a bit easier. All of the equipment has to be taken down and securely stored every night. Last night Carolyn and I left around 1:15 am. When we left Arianne Martin (playing Wanda), was still in Hannah’s makeup chair getting her hair prepared for tomorrow – and old school finger curl. The assistant director didn’t leave until 3:00 am. Ben, the Gaffer, doing the lighting has a general idea of what he’ll need for each shot – but the needs change and they must have all manner of scrims, screens, panels, filters, stands, and different kinds of lights available. Those aren’t the correct technical terms – but he’s been too busy to ask. They speak a language I don’t understand. Power supply was a problem at first – but now many yards of heavy-duty electrical cords snake inside and outside the set. Some even snake to distant buildings in the Village that have power. There aren’t any women on the gaffer crew – so one cord wends its way to the distant men’s room. It’s now about 8:00 pm. Today’s call time was a merciful 12:30 pm. All of today’s scenes will be shot in the tiny bedroom. Two exterior shots were planned – but have been scratched because of the weather. There are three actors in today’s scenes. The scenes take place in a vaudeville theater dressing room. The tiny Victorian bedroom has been transformed into the dressing room. There are between eight to 13 people in the tiny bedroom: the talent (Wanda, Howard, and a Doctor); director (Carolyn), camera (Kimby), Camera’s assistant (Anthony), the Assistant Director (Barker), Karlo (boom operator for sound) the gaffer (Ben), script supervisor (Jordan – the still photographer is filling in for that position today – the script supervisor isn’t on set today, I’m not sure why). Stationed in the long narrow hall right outside the door are Hannah (makeup artist), Colin (wardrobe), Nancy (art department), Max (grip) and me. I’m sitting on a mover’s blanket with the laptop on a camera case. In the downstairs hall are Chris (art director) and one or two additional grips running back and forth to the light truck, and Jenna the production assistant. The ex-extra turned production assistant Monica, is stationed outside on the porch. 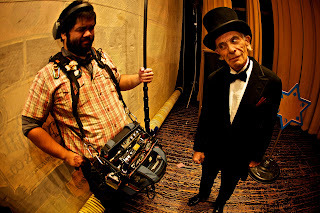 Those of us in the hall are on call to provide whatever is necessary for the shot: a makeup touchup, a prop, costume fix, battery change, light filter, water bottle, a ride to wardrobe, or a blog entry. We come and go as necessary but freeze movement and conversation when the camera is rolling. The old Victorian house is very creaky, so no one moves an inch when the camera rolls. Conversation and movement resumes what “cut” is hollered out. While driving the talent around I spoke with Mr. Earl Goodrick II. He’s playing a doctor who looks at Howard’s de-fingered hand. At dinner we sat together and chatted. I commented on the long hours. He said this was nothing. He was in “On Any Given Sunday” shot at the Texas Stadium. They worked for 24 hours one day. They only stopped because the sunrise ruined the light. That’s a long day. Mr. Goodrick also commented that this is the only job he’s done for free, because he liked the story so much. Thank you Mr. Goodrick! It’s about 11:45 pm. A bit ago we just got word that Sam Funk’s flight was cancelled. He’s flying in from Wyoming for the final two days of the shoot, the brothel bar room scene. He was supposed to be here late tonight. The same weather that’s keeping me here for an extra day, is keeping him from getting here for the final shooting sequences. He plays a cowboy (he is a cowboy), my grand-uncle Kemper. He will try to get a flight first thing tomorrow morning. Tomorrow’s call is at 12:00 so – he has some time to get here. The tiny room is now set up for the final shots of the evening. This scene has a dancing girl, Wanda, and Howard. The lighting crew is breaking down all the gear that won’t be used – getting a start of the lengthy loading process. They just turned off the light in the hall because it was getting in the shot. Now the only light is from my laptop. The grips have headlamps. I don’t, nor does Nancy who now has to refill the prop Whiskey bottle in the dark. Earlier she fashioned a funnel from gaffer’s tape (like painter’s tape) so I’m sure she can manage in the dark. It’s now very late and we’re back at Carolyn’s house. When I came in, Carolyn was listening to the music James McMurtry composed for the film. He e-mailed her the tunes he’ll be strumming during the brothel bar room scene. It sounds great. Kimby and Carolyn are now planning tomorrow’s action. Kimby gets to sleep on the cot tonight, and I'm on the couch. Today we are back at the Dallas Heritage Village. Several different buildings are being used as sets. Shooting is finished in the first building, an old Dallas train depot. The scene is Wanda buying a train ticket to Idaho. The Director of Photography’s grandmother is an extra in the scene. She is just one day shy of 88 – and game for working as an extra. She thoroughly enjoyed seeing her granddaughter Kimby in action behind the camera. It’s a sunny day, but the building interiors are cold. She looked great in the 1920’s clothes. The crew and talent are now shooting a few scenes in a tiny shotgun house. In this scene, Wanda leaves her baby Lamonda with another woman, Virginia, to take care of her. Because the space is so small, only the essential crew can fit inside. I haven’t ventured inside for a look because the space is so tight. Occasionally, Barker yells (I’m resisting saying “barks”) “lock it down, quiet on the set” that gets relayed and yelled by a few more production assistants (Jenna and Sophie) stationed outside around the buildings. We all stop moving and talking so the scene can be shot without any interference – say a stray production assistant walking by an outside window – therefore ruining the shot. 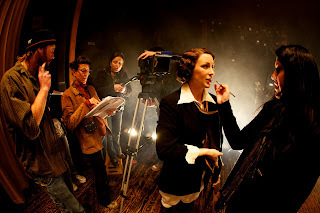 Pictured from left to right are the Assistant Director Barker White, my sister the Director Carolyn Macartney, Kimby Caplan, the Director of Photography, Arianne Martin as Wanda, and the makeup artist Hannah Handshy touching up Arianne’s lips before a shot. The cast and crew are amazing. While some are getting paid, most are volunteering, or providing their services for a greatly reduced rate. Some crew members are even providing equipment -- Mike the explosives tech brought along his haze machine that’s provided the great atmospheric light. It’s now 4:30 and almost time for the Extra’s 5:00 call. We’re shooting more travelling circus audience scenes after the sun goes down. Colin and Michaela will soon be overrun with 15 or so Extras needing the exact clothes we wore yesterday. Wardrobe and Makeup are using a separate building that is one of the relocated small old homes. Lucky for wardrobe and makeup, Patrick the production coordinator, located a Heritage Village staff person who knew where the furnace switch was located. It turns out the building has heat after all! The staff person wasn’t aware that the AC was on, not the heat. Patrick got it sorted out – so now the talent and extras don’t have to shiver while getting ready for the action. Patrick also tracked down some much needed toilette paper for the bathrooms in the same building. Details matter. It’s now about 11:30 pm and we’re done shooting the audience scenes. The extras are done with the shoot. They were all very game to hang out in the cold circus tent for hours to be background. Earlier in the day – while I was blogging about Kimby’s lovely almost 88 year-old grandmother, I missed the haze machine setting off a fire alarm in the train depot. It was a quiet alarm and luckily the fire department did not appear with lights ablaze – they would have ruined the shot. Soon after darkness fell – we had a slight animal emergency. Jenna, one of the production assistants, spied an opossum nosing around near the Craft Services table. We had to quickly mobilize and move Craft Services to a well-lit location – and away from the hungry opossum. Just before that, another production assistant had to make a run to a pharmacy to get an emergency eye patch. One of the grips needed it to cover up a possible case of pink eye. While I’m not sure if a black patch will stop the spread of pink eye, it sure makes it easy to know who to stay far away from. It’s now about 12:41 and we’re still shooting – almost done for the night. This is however my last blog from the set. I’m heading back to Denver tomorrow – weather permitting. It’s supposed to snow here in Dallas AND in Denver. So, I may make it back to set after all. 1/7/11, Dallas Shoot, Day Two, 12:00 Call time. Shooting today, and for the rest of the shoot is at the Dallas Heritage Village at Old City Park, in Dallas. The Heritage Village is very near downtown Dallas – situated right next to a busy highway exchange. The Village is a collection of authentic old buildings that were saved from the wrecking ball and moved here. It’s got it all - a saloon, train depot, bank, general store, and many old homes. The Village even has a couple of live donkeys and I’ve spotted at least one sheep. It’s a fairly sprawling place. The key crew members are all in radio contact – critical for communicating across the large distances. The donkeys were braying a bit ago – some added authenticity. I’ve yet to hear the sheep baaaa. It’s about 4:00 pm and they’ve finished shooting the first scene already. In the scene, Wanda looks at her newborn baby Lamonda in a hospital baby crib, picks her up and leaves. The production coordinator, Patrick Clinton, was able to locate a cute as a button six-week old baby for the scene, Josie. The script calls for the baby to be swaddled. Colin and Michaela (the wonderful wardrobe folks) were at a bit of a loss regarding proper baby swaddling techniques. Luckily, one of the extras happens to be a military pediatric nurse, and has swaddled babies around the world. He very kindly agreed to authentically swaddle the baby. Josie and her Mom are very pleasant to work with. The live baby was only used for the final shots. A fake baby was used for all the rehearsals etc. When Barker, the Assistant Director finally called for “the live baby,” little Josie performed beautifully. She kicked and squirmed a bit when placed in the baby hospital bed (despite the authentic swaddling), but seemed to enjoy looking at the overhead camera and the complicated lighting array. The shot was beautiful. After Josie’s camera work was finished, it was all quiet on the set to record live baby sounds. Karlo (the omnipresent steady boom operator) dangled the mike above Josie and she provided a bit of baby crying audio and then some calmer baby sounds. Josie and her mom return tomorrow, playing a different baby part. Arianne Martin as Wanda looked great as usual. 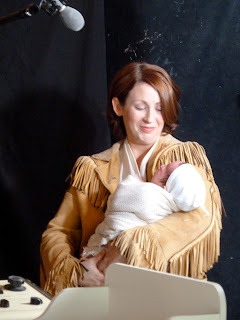 For this scene she wore a hand made western fringed leather jacket. The jacket is a work of art – Wanda made it for our Mom, Carla, when Mom was in high school. Mom’s held onto it for all of these years. It seems remarkable that a jacket made by Wanda is now appearing in this movie about Wanda’s life. Thanks Mom for letting us borrow it. 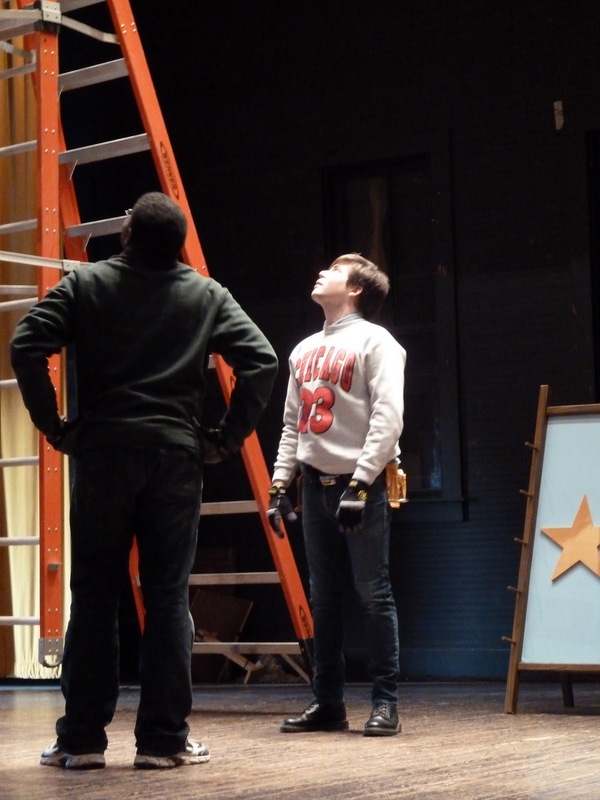 The cast and crew are now transitioning to a different set at the same location – the traveling circus tent. Chris, the production designer has erected a gorgeous tent. There are more extras today, and more talent. Wardrobe has done an excellent job again of making all of us (the extras) look like country folks from the 1920’s. Sadly for me, a fur stole is not a part of my costume. The action is now in the circus tent. We just finished shooting several audience scenes. Wanda and her husband are in the audience for a marksman’s act (part of the travelling circus). The marksman calls for volunteers, Wanda goes up on stage and shows off her marksmanship skills – her husband leaves the circus tent in a huff. Right now the special effects guy has loaded up the target with “squibs” or fake little explosions that simulate a bullet going through the paper target. Barker keeps alerting us all that “the set is hot, the set is hot,” - Which I assume means there are explosives on set. Wanda and the marksman also shoot blanks, and when loaded the “gun is hot – a hot weapon on the set.” And, just before the action with the live weapons and explosives, there’s a “fire in the hole.” A few minutes ago someone accidentally discharged one of the guns – an unannounced fire in the hole. I guess perhaps that’s considered fire escaping the hole? We finished shooting around 11:30 tonight. All of the extras gamely hung in there until shooting wrapped. We are getting good at pantomiming clapping and general audience reaction. Almost all of the extras will be back tomorrow for some more audience action. The cast and crew continue to work together like the cogs of a well oiled machine. The machine will continue to crank out some more excellent work tomorrow afternoon and evening. 1/6/11 First day of shooting. Carolyn and I arrived in Waxahachie just before sunrise. The location was already a beehive of activity. The local fire department was on-sight with their lights ablaze. The efficient wardrobe folks had arrived first, and not knowing where the light switch was, pulled the fire alarm by mistake. The fireman were of course very nice and shut off the blaring alarm within a few minutes. There are some pyrotechnics involved later in today’s shoot – so its a comfort knowing the Waxahachie Fire Department is quick to respond. Today’s shoot is at the Chautauqua Auditorium in Getzander Park. The Auditorium is a bit over 100 years old, an all wood octagonal structure with a lovely stage. For the movie, it is the Vaudeville stage. As I write this they are testing out the smoke machine – which is working with gusto. I have a feeling the fire department may be making a return appearance with the abundant fog swirling around. 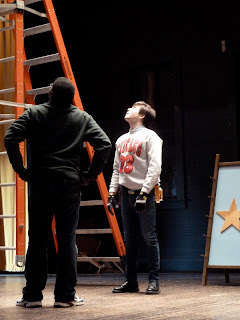 The set design folks are busy making slight, non-permanent alterations to the existing backdrop – removing references to various trademarked names and also the City Council’s thank you for the Auditorium’s 1975 restoration. Rehearsal is about to begin – so all quiet on the set. Meanwhile, I went down to wardrobe (below the stage), and found the wardrobe folks fanning out the dressing room because one of their purses partially melted. Someone had moved the vinyl purse against a low cosmetic mirror light – luckily they smelled the real smoke, moved the purse and averted a real fire. The cute pink purse now bears a small black burn as a Wanda the Wonderful memento. There are thirty on the crew and three actors today. At a 10:1 ratio, the talent is in good hands. There are also about thirteen extras (me amongst them) all decked out as vaudeville audience members. It’s a cold but sunny January morning in Waxahachie. The Auditorium is unheated – so we the extras – head out into the sunshine every chance we get. Our period costumes look wonderful, but are un-insulated. I’m probably the luckiest extra because I get to wear a long fur stole over my short-sleeved dress. While absolutely no animals have been or will be harmed making this movie, I’m sure that several minks died (many years ago) for this stole. It’s after lunch now. As this is an extreme low budget shoot, the Assistant Director had the unenviable task of informing the extras that lunch would not be catered for them – only for the cast and crew. The extras are permitted the extra – i.e. – leftover food. Luckily, Donna the caterer provided lots of food, so there were lots of yummy leftovers. This afternoon’s scenes concentrate on Wanda, Howard, and the vaudeville announcer. Wanda and Howard perform their vaudeville show. Wanda shoots at a spinning target hitting all the glass balls on the target as it spins around. The Assistant Director warns everyone before a live blank is fired “fire in the hole.” Arianne as Wanda and Christian as Howard are doing a great job. 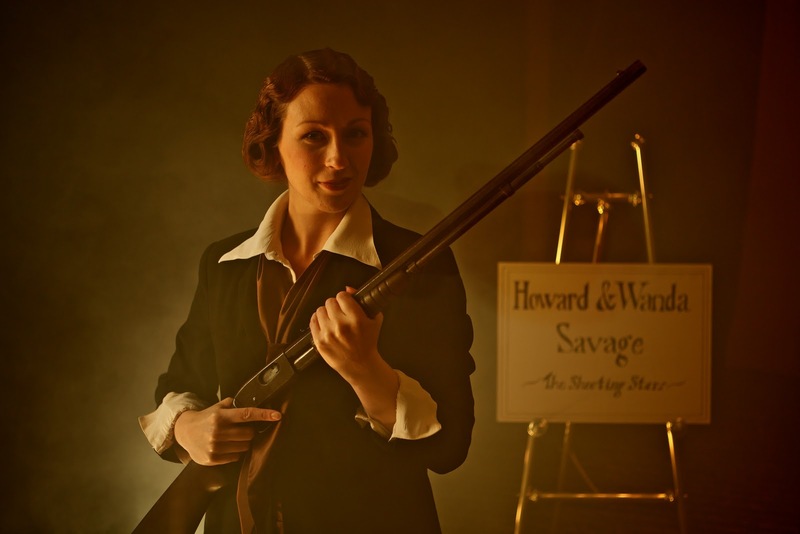 Arianne looks wonderful and obviously knows how to handle a gun. Christian looks great as the soon to be fingerless Howard. So far the pyrotechnics have gone off without a hitch, and without a visit from the friendly firemen. Every scene takes a lot of preparation – with most shots requiring a new camera position, lens, and lighting change. Each scene is shot many times at different angles etc. The fogger goes off periodically to reproduce the ambient haze. While many of us spend lots of time sitting around (or blogging around), Carolyn, Kimby, Anthony, Carlos, Barker, and the grips are constantly busy – no rest for them. It’s now 9:00 at night and the shoot’s been going for 13 hours. I think this is the longest day we’ll have. All the extras were excused several hours ago. The talent and crew remain diligently focused on getting the shots and being done for the day. Tomorrow’s call is a bit before noon – I hope. I'm one of Wanda's grandchildren, and the Director's sister. I offered to come to Dallas and help with the final week of shooting. Carolyn asked me to blog about the experience. In real life, I'm a working mom in Denver, Colorado. My wonderful husband and kids are very understanding -- and encouraged me to help out.